After the debacle that was A Heartbreaking Work of Staggering Genius, I wanted something that I could recover with. And my immediate reaction was Discworld, where I could both read something new and yet guaranteed to make me happy. Since it was a Witches book, I was really looking forward to this next installment. 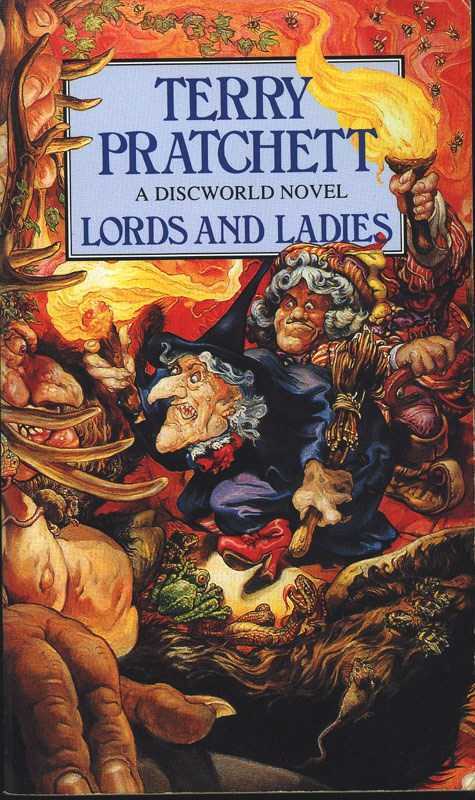 Lords and Ladies picks up when Granny Weatherwax, Nanny Ogg and Magrat Garlick return home from their extended travels following Witches Abroad. Magrat returns to find that her sweetheart, King Verence II, has already started preparations for their wedding. Perturbed by how suddenly and imminently she will become Queen of Lancre, she has a falling out with Granny and throws herself into learning how to act like royalty. At the same time, Granny and Nanny are concerned that the standing stones keeping the Fair Folk at bay may be weakening. 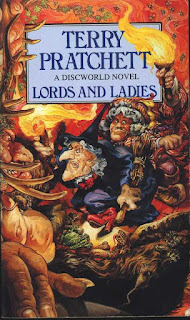 While the Witches are probably my favourite of the Discworld sub-series, I thought that Lords and Ladies was a bit weak compared to the previous installments of the series. Not that this makes it bad, it's just hard to match a corker like Witches Abroad. By itself, there really isn't anything that that I can criticise about Lords and Ladies, it just has very tough competition. One thing that I absolutely love is Pratchett's depiction of elves. Considering that the Discworld is a riff on traditional fantasy tropes, he could have modelled them on the graceful and wise elves that you get in things like Lord of the Rings or D&D. But instead he went for the properly old-school elves that steal your children, and I just love that. It adds just the right amount of threat and eeriness. Additionally, I really liked the touch about how the average person in Lancre perceives the elves. In comparison to Granny Weatherwax and Nanny Ogg, who know just how awful elves are, the rest of the population has gradually forgotten the creepy, child-stealing part of elves and they only really remember the glamour and the pretty laughter. It was a nice touch.